When visiting Arizona, resist the temptation to shoot or manhandle the cactus. The Saguaro cactus has become so endangered by people shooting holes in the plants, that damaging or cutting down a cactus can earn you up to 25 years in jail. 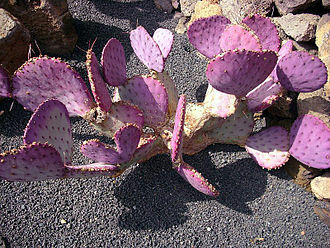 Purple Pricklly Pear: Found throughout the southwest, these colorful plants are known for both their vivid flowers and fine hair like needles. The Grand Canyon is a colorful, steep-sided gorge, carved by the Colorado River, in northern Arizona. Arizona is home to one of the most well-preserved meteorite impact sites in the world. 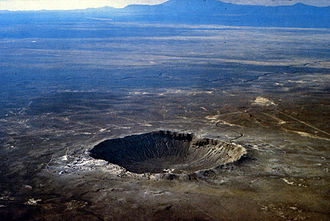 Created around 50,000 years ago, the Barringer Meteorite Crater (better known simply as "Meteor Crater") is a gigantic hole in the middle of the high plains of the Colorado Plateau, about 25 miles (40 km) west of Winslow. Arizona is located in the southwestern area of the U.S. And is recorded to be the 16th most populated state in the country. The capital of Arizona is Phoenix which is also the largest city in the state. 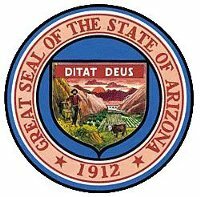 Arizona was introduced as the 48th state to the U.S. On February 14th, 1912. The state of Arizona is also widely known for its desert climate, especially in the states southern region. In this area the summers become extremely hot and winters are often times very mild in nature. The northern part of the state has pine forests, douglas fir, spruce trees, a large plateau, and various mountain ranges. This region experiences much more moderate weather and can experience large snowfalls during the course of the winter. Arizona is also known to be one of the Four Corners states. It borders New Mexico, Utah, Nevada, California, the country of Mexico, and shares one point with Colorado. It is also one of the most populated landlocked states in the country. Arizona Is also home to many natural wonders such as the Grand Canyon, nationals forests and parks, and many national monuments. Roughly 25% of the states land is federally owned and serves as home to Navajo Nation, Hopi Tribe, Apache Tribe and various other tribes in the region. The climate in Arizona varies drastically depending on the specific area, due mostly in part to the many elevation changes and localized climate conditions. In areas of lower elevation, the climate is considered to be desert with very mild winters and very hot summers. Because of the relatively dry climate, big temperature swings are not uncommon between day and night in the lesser developed regions of the desert. The northern part of the state is in a higher elevation zone and thus experiences a much cooler climate with cold winters and mild summers. Arizona was recorded to have a population of close to 6.5 million in July of 2011. The state is also home to the largest number of speakers of various Native American Languages of all the states. Over 85,000 peoples within the state speak Navajo, and over 10,000 speak Apache. 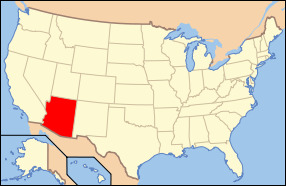 Most of the states population resides in the major cities such as the capital Phoenix, or other popular cities such as Tucson, Mesa, Chandler, or Glendale. Due to the diverse climate and environmental conditions, a large variety of activities are available in the state. Many people also visit the state to enjoy one of the large cities with scenic landscapes as well as the beautiful scenery. Arizona is one of the few states where breathtaking scenery can be enjoyed along with big city leisure.